What a great final week of travel! 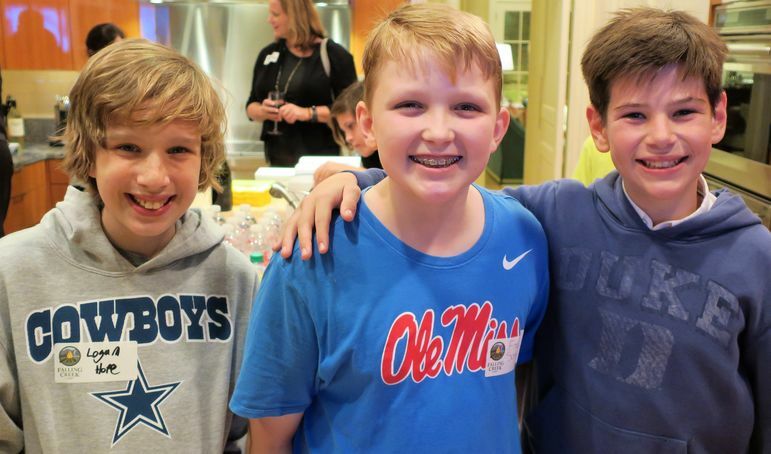 Yates got to visit camp families in Houston, TX, Dallas, TX, and Bronxville, NY to round out the travel season. It was exciting seeing so many old and new faces, and it makes us that much more eager for the summer to start again. If we didn’t make it to your city this year, don’t worry – we still have one more Falling Creek Camp Reunion and Movie Show next week in Asheville, NC! The best part is, we’ll be streaming it live so our camp friends all over the world can tune in. Connect with us on November 14th at 7:00pm EST through our Facebook page, and you can still have the opportunity to get this year’s limited edition trunk sticker! This past Monday, we headed down to the big state of Texas to visit our friends in Houston. Carleton and Winifred Riser were the gracious hosts of the evening, and we had a great crowd for the first Reunion and Movie Show of the week. 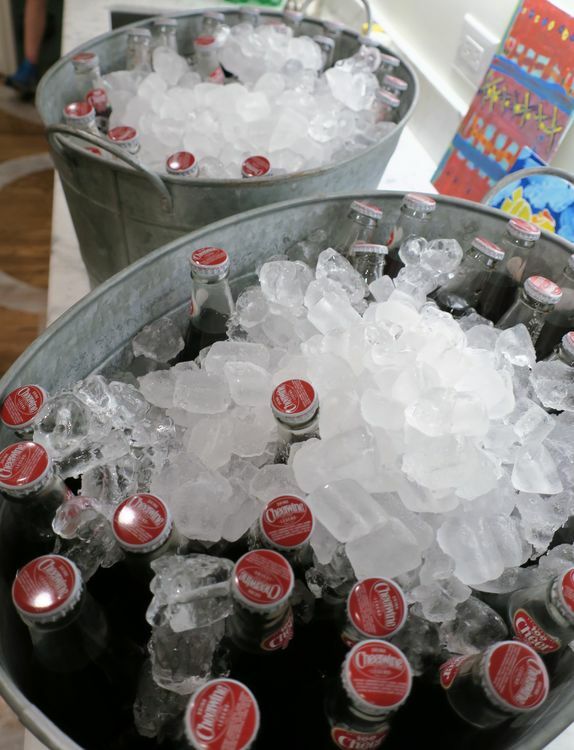 Winifred surprised the crew with cold bottles of Cheerwine, which is a camp favorite that we get treated to once a week at Cookout Dinner. 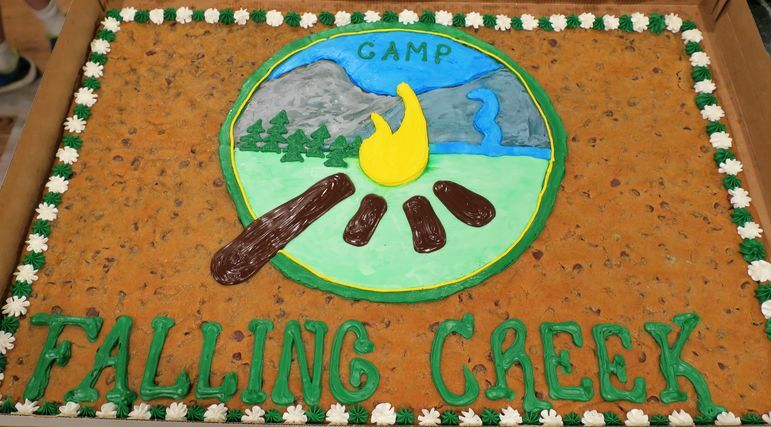 The Fannings also brought a giant cookie cake of the Falling Creek logo, which was just as beautiful as it was delicious. Thanks to the Fannings for the beautiful cookie cake! Born in the South...raised in a glass! Carleton went to Falling Creek as a camper in the 70s and 80s when Yates and his brothers attended. The Riser sons, Robert, Mac, and young Carleton are all returning this summer, and we can’t wait to see them at Main Camp. Yates with Carleton Riser and his 3 boys, Mac (left), Robert, and young Carleton. Nicci and Chris Greely served as the camp doctor family during the final week of Main Camp again this past summer, and they took the time to come out to the Reunion and Movie Show as well. Their three boys, Grant, John, and Spencer, were also there, and we’ll be looking forward to having them return to Main Camp in 2019 too! 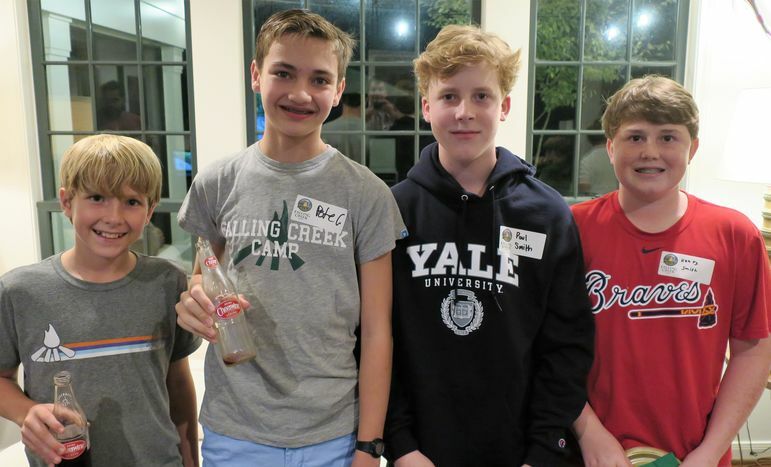 The three Greely boys and Robert Riser are all members of the Honor Council, a group elected by their peers for modeling the FCC Code, who get to attend the first part of staff meetings and represent the camper body. Yates with the Greeley family. Nicci and Chris have served as camp doctors the past two summers during the final week of Main Camp. The Greeley boys will be back at Main Camp in 2019! 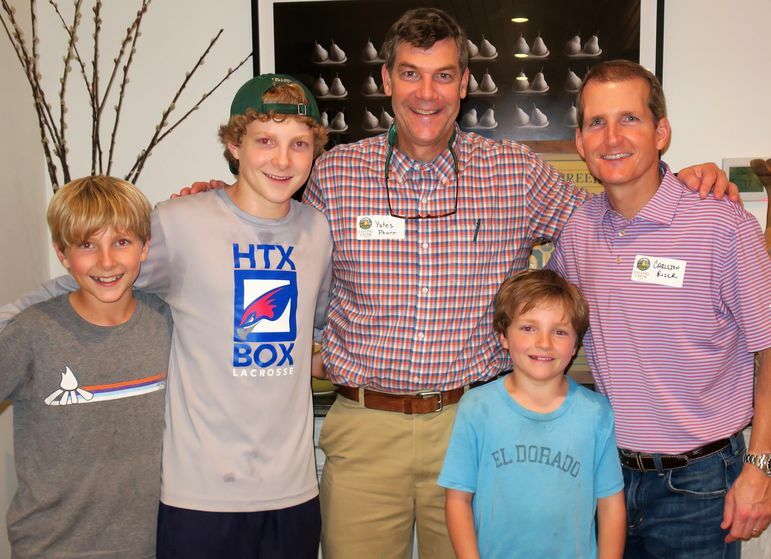 A big thank you also to Patrick Fanning, Paul Smith, Harrison Wallace, Pete Curtis, and Wells White who shared stories and helped Yates explain details about Falling Creek to new families. We remain thrilled that all of these boys, and their brothers, will be back this summer. 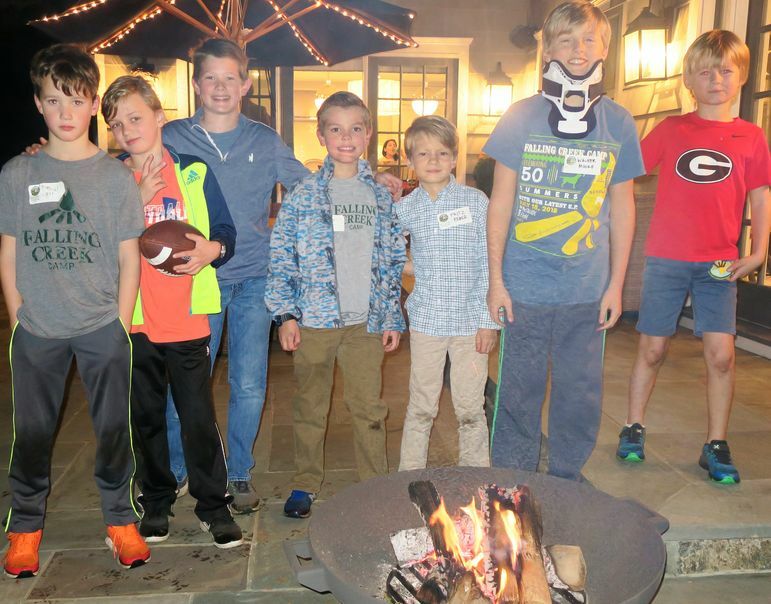 It was another great evening to reconnect with FCC families and share our wonderful community with the families who came to learn more about camp. It was a great turn out in Houston! 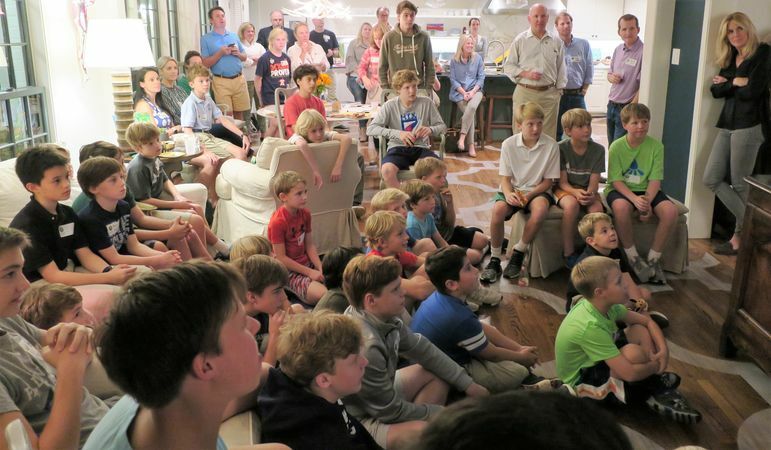 The following evening was spent in Dallas, Texas at the Minnehan family home. 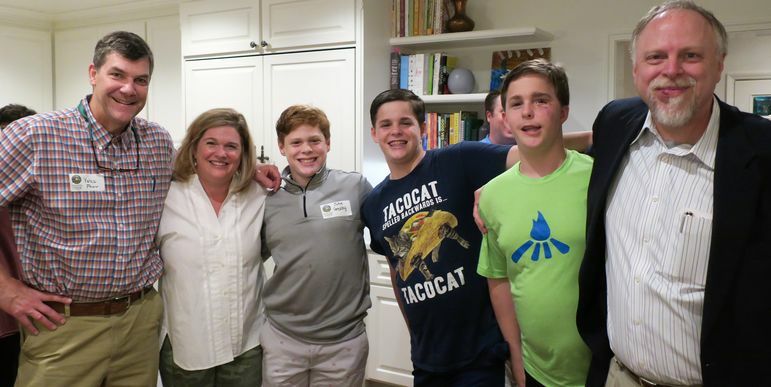 Marianne and Brian are fantastic hosts, and both Minnehan boys will be returning to Falling Creek this summer. We’re looking forward to having both Patrick and Davis back at camp in 2019! One of the best parts about having familiar faces at these reunions and movie shows is that veteran campers can help share their stories about camp with interested families. 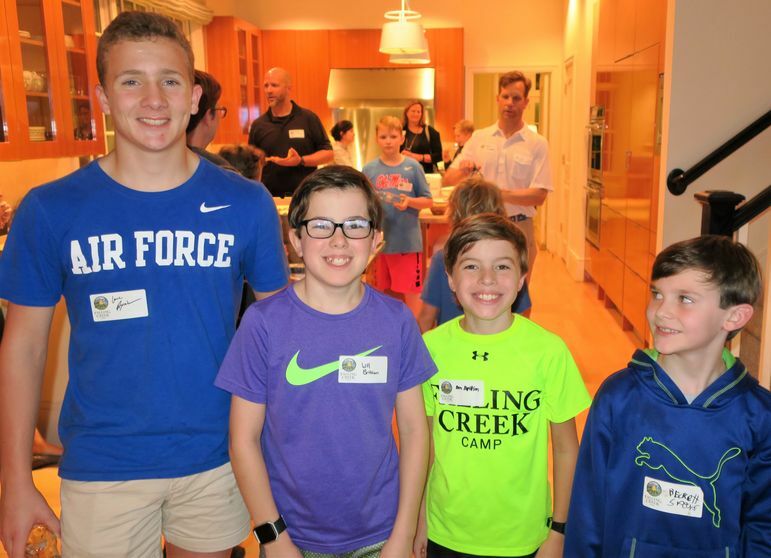 Patrick, Lance Broad, Will & Ben Brittian, Logan Hope, Harrison Keyes, and Erik Soelberg were a great help with the presentation and telling the new families about their Falling Creek experience. Great to see everyone in Dallas! Yates also enjoyed connecting with Emily and Rick Broad, who were counselors with Marisa and him. Emily and Marisa both worked on the swim docks together, and it is fun to still have those connections years later. 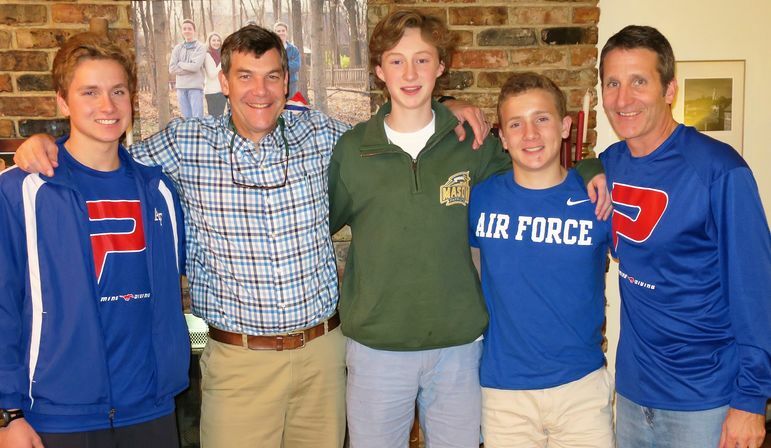 Their three sons, Charles, Bennett, and Lance, have been coming to Falling Creek for the past 13 summers and it is incredible to see that community continue through generations. To wrap up the fifth week of travel, Yates headed north to New York. 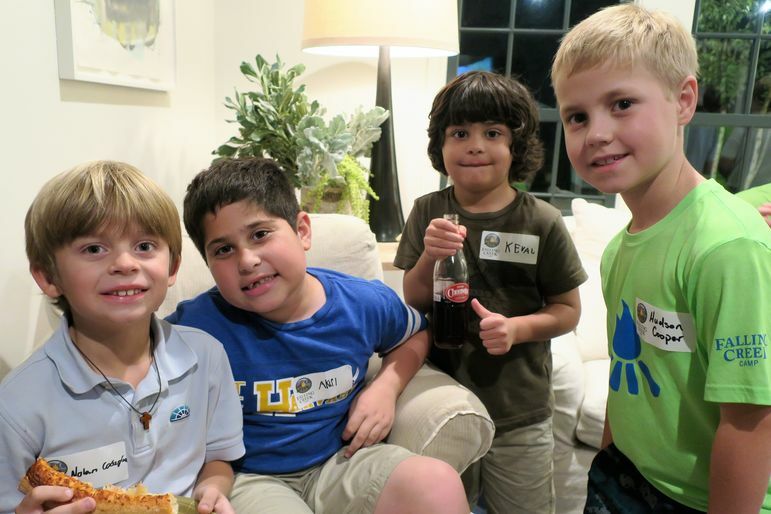 Emily and Mark Liggitt hosted at their beautiful home in Bronxville, NY, and we got to catch up with their sons Walker and Marshall. 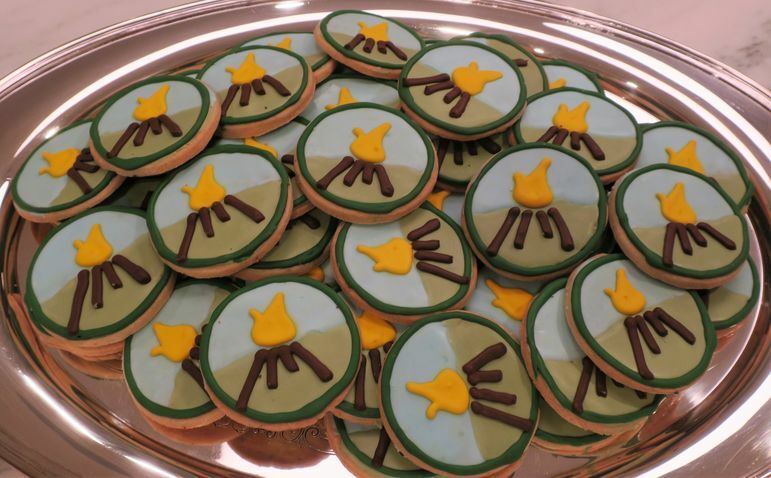 Emily also shared some awesome Falling Creek cookies, iced with a beautiful picture of the FCC flame. Emily shared some beautiful cookies at the New York Reunion and Movie Show! 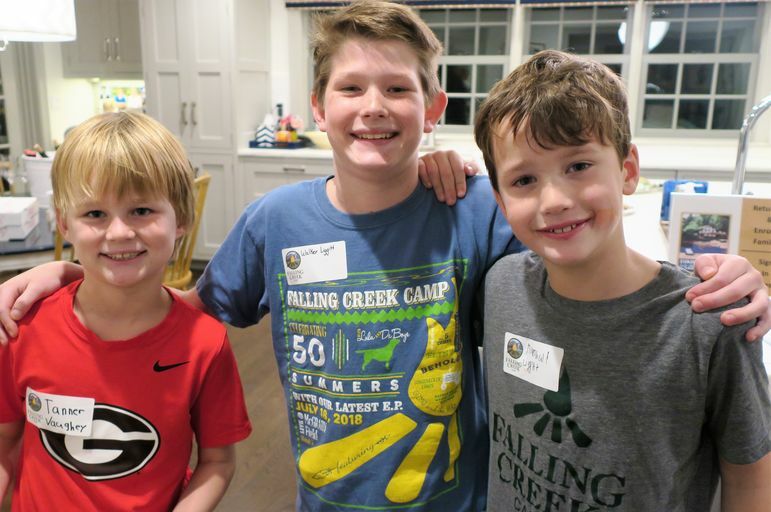 Several of the veteran Falling Creek campers helped tell their stories of camp, including Gregory Hefner, Stratton Werner, Walker Moore, and Walker and Marshall Liggitt. Gregory and his dad will be returning for their 4th Father/Son Weekend this summer, and we’re excited to have them back. John Reynolds was a camper who was originally from Augusta, Georgia, and came to Falling Creek in the 70s and 80s. His son, Oliver, also came to the Reunion and Movie Show, and it was great to connect with them both. 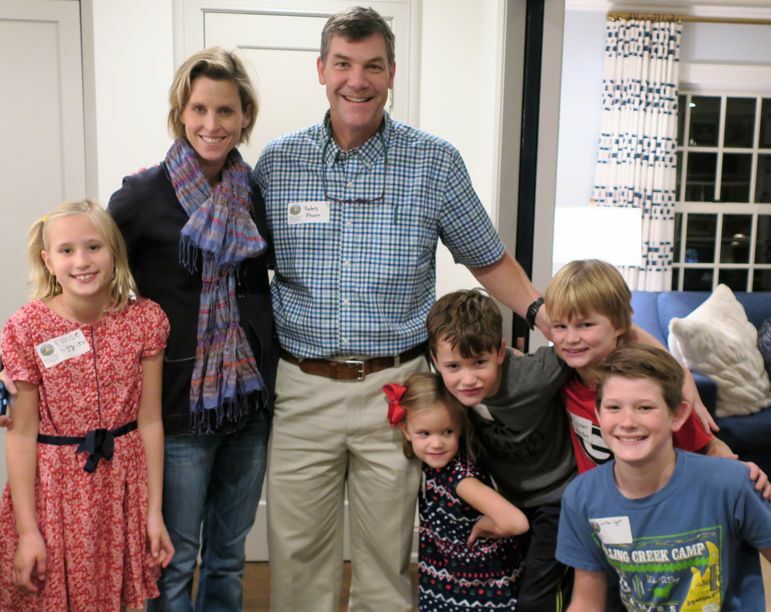 Tyler Vaughey attended camp in the late 70s when he was living in Jackson, Mississippi, and he also brought his family. His son Tanner is coming to Falling Creek this summer, which was exciting to hear. It was a great week to end on, and we enjoyed seeing our friends in Texas and New York. Thank you to the 15 wonderful families that have already hosted us around the country this year. We appreciate everyone who took the time out of their busy schedules to connect with us at the Reunions and Movie Shows across 10 different states, showing once again how strong the Falling Creek Community is. We’re looking forward to our last show of the season next week at the West Family home in Asheville (and online through Facebook)!